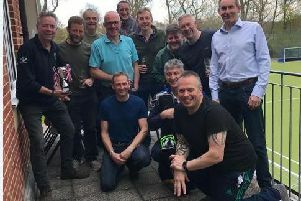 Bognor finished their Hampshire League division-one campaign in second place after rounding off the season with another fine away win, a 33-12 success at Overton. The game started with a try from kick-off for Bognor as Billy Toone directed the ball into the hands of Tom James, who broke the first tackle. Finding himself in acres of space the tight-head prop fed Chris Webb, who used great footwork and lovely hands to send Paddy Burnett over in the corner. With ball in hand Bognor always looked more dangerous. Lee Balchin, in his last game as captain, Joshua Burgess and George Castleton were showing savage intent. Pat Gains was again alongside his rapid centre partner Sam Newcombe, the two linking well in a move that saw the No13 score his first of the day in typical Newcombe fashion. Sublime pace and gruesome footwork made the finish all the more spectacular. Sean Power’s conversion attempt was fractions wide. Venci Angelov and James Barlow were enjoying the scrum and both were heavily involved in a lot of the dogwork. Joshua Riggall and Jack Hornibrook looked fired up, great handling and pin point kicking from Riggall released pressure when Overton looked to pin the corners. Bognor’s penalty count continued to rise. Adam Knight was defending endlessly but was also pinged for a very tight offside call. Overton smashed one into the corner and sent it wide, but Gains nailed his man into touch. Newcombe managed to get his second just before half-time. The electrician burst through the tackle after a lovely offload from Burgess, finished under the posts and converted by Power. In the second half, Jonny Lang and Danny Greenslade made their intentions clear from the word go with some lively defensive work and powerful carrying. Bognor were caught napping, Overton’s nine picking at the base of a ruck and seeing a gap and the winger finding space and finishing tidily in the corner. Balchin and Castleton were covering the whole field in defence and attack with Toone keeping the game ticking. Chris Webb saw some space out wide, but was stopped short of the line after an expert tackle from the home side’s No12. Hornibrookused his agility to duck and weave out of a table to provide Newcombe a simple pass for his hat-trick and make him top try-scorer for the season, the score now 26-7. Overton responded quickly, the No8 carrying well in midfield but stopped five metres out. The ball was slung out wide and finished by the centre. Jeremy Newton-Young again proved his worth for the first team when he came on. He almost looks like he is gliding when he runs with ball in hand and can tackle well above his weight. The final try came from the hard-working Riggall as the Bognor boys showed grit and determination to battle back from the endless setbacks and score in the corner after some lovely hands from fly half Power. Bognor: James, Angelov, Webb, Barlow, Knight, Balchin, Castleton, Burgess, Toone, Power, Burnett, Gains, Newcombe, Hornibrook, Riggall, Greenslade, Newton-Young, Lang.